Panoramic view of the Hellenic theatre at Epidaurus. A young cast of "Princess Turandot"
Theatre (British English and also American English), or Theater (mostly American English), has several meanings. The word comes originally from the Greek Theatron, meaning roughly, 'a place to behold'. In American English, the word 'theater' can mean either a place where films are shown (this is also called a cinema) or a place where live stage plays are performed. In British English, 'theatre' means a place where live plays are performed. Some people, both English and American, use the spelling 'theatre' to mean a place where live plays are performed, and the spelling 'theater' to mean a cinema. 'Theatre' can also mean the business of putting on plays. An actor might say "I am in the theatre business", or a writer might say "I write for the theatre", meaning that they write plays, rather than writing for movies or television shows. Neolithic stone mask, 7,000 years BC. The first people we know created plays were the Ancient Greeks, about the year 500 B.C. They divided plays into two kinds: tragedy and comedy. This division is still used today. The best known Ancient Greek writers of plays are Aeschylus, Sophocles, Euripides and Aristophanes. Some of their plays survived, and are still performed today. These ancient Greek plays were performed outdoors in large amphitheatres, so that many people could see them. There were contests among the playwrights (people who write plays are called playwrights) and the winner would get a prize. The Greeks had many brilliant ideas. They used mechanical devices like trap doors and the machina: a crane for winching gods on and off the stage (hence 'Deus ex machina'). They had a Greek chorus that offered information to help the audience follow the performance. The chorus comments on themes, and shows how an audience might react to the drama. The players wore masks. Illustrations on vases show helmet-like masks, covering the entire face and head, with holes for the eyes and a small aperture for the mouth, plus a wig. The mask was to ‘melt’ into the face and allow the actor to vanish into the role. Therefore, onlookers did not think about the actor, but thought about the character. In the Middle Ages, the Catholic Church began to use theatre as a way of telling the stories from the Bible to people who did not know how to read. They wrote Mystery Plays, where each part of the Bible story would be a play put on by a different group of people. They wrote miracle plays which were about the lives of the saints. They wrote morality plays which taught the audiences how to live a good Christian life. In the 1500s, groups of actors toured around Italy performing comic plays to entertain townspeople. These plays were called Commedia dell'arte, and different stories would be created around the same group of characters. Often the spoken lines would be made up by the actors for each performance. Other kinds of plays called Neoclassical Dramas and Neoclassical Comedies were also popular in Italy and in France at this time. These plays were written to copy the style of the plays from Ancient Greece and Rome. At the end of the sixteenth century (before 1600), the traveling actors began to perform in fixed theatre buildings. This was the period when William Shakespeare wrote. He lived from 1564 to 1616. At that time, in England, women were not allowed to perform, so male actors would play female characters. His theatre was in London, England. It was called The Globe Theatre. It was an outdoor theatre and plays were performed in the daytime for large audiences. His plays were very popular and many are still performed today. Many people believe Shakespeare was one of the best playwrights (a writer of plays). Plays including Shakespeare's were banned during the Protectorate'. After that, many more were written and acted. After World War II, playwrights in Europe and the United States began doing plays in a new style called "Theatre of the Absurd." After seeing the horrors of war, these playwrights felt that all their old values had been destroyed. Playwrights such as Samuel Beckett, Eugène Ionesco, Harold Pinter, and Jean Genet wrote plays that are considered to be "Theatre of the Absurd." The plays written in this style make people think about questions like "what is it like to be a person in the world?" and "what does it mean for a person to be free?" They are often filled with sad emotions, such as worry, fear, and thoughts about death. Theatre breaks are a form of short holiday, based around viewing a theatrical convention show. Theatre breaks tend to include a nights hotel accommodation included in the price. 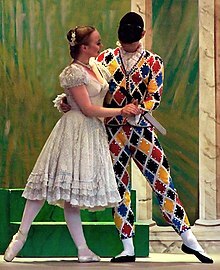 Wikimedia Commons has media related to Theatre.